Art is a powerful tool. It gives us the opportunity to look within and without, to develop a second sight in regard to our own thoughts and feelings. In creating art we develop our sense of creativity– that shifting tide of ideas that carries us, rising and falling–which flows through us in ways that are equally uplifting, engaging, frustrating and rewarding. It is this process itself that's just as important as the final work produced. But art is more than just a mirror and a means to self-discovery. It is also a healing force that powerfully connects us, conveying our shared experiences through expressive lines, colors and shapes. Art brings us closer. It inspires compassion, empathy and change. It speaks to us on a level where words often fail. And, art can been found anywhere. 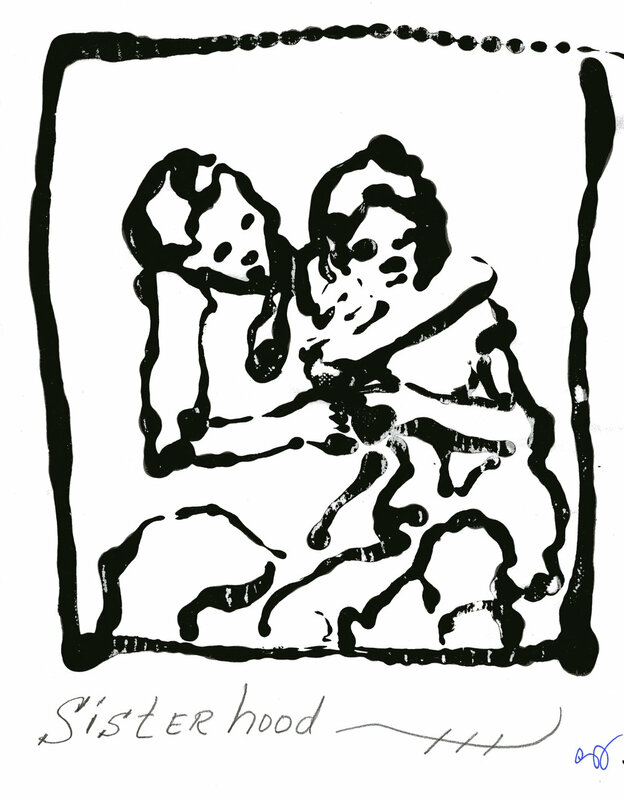 It does not simply reside on the walls in a museum, but exists even in the smallest of scribbles made by a child's hand. So, allow yourself to be bold. Explore your creative boundaries and be swept along by your imagination. Allow yourself to dream. To draw or paint. Take a photograph. Dare to see the world through an artist's eyes. Then connect and share your vision with the person next to you. It is through this action that art becomes truly meaningful. 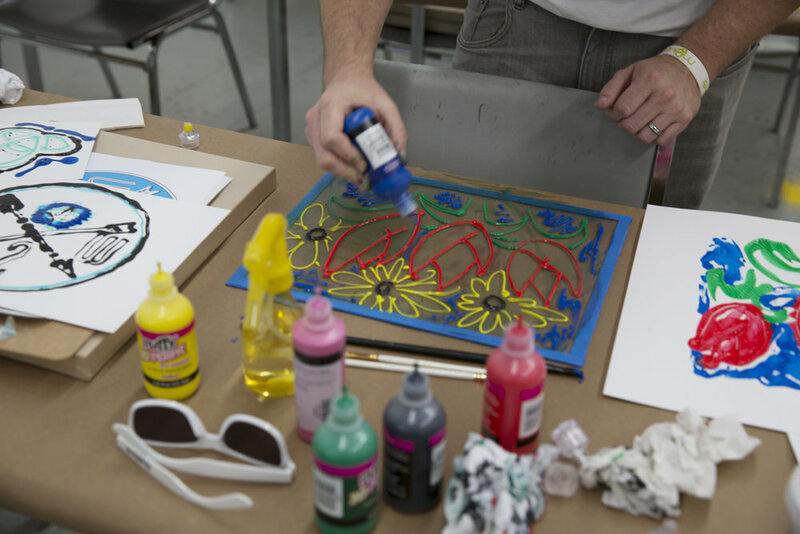 These small group sessions allow veterans to meet and learn from professional artists, to discover and cultivate their own talents, and to transform their experiences through thoughtful and therapeutic forms of self-expression. After each session, an image gallery and journal reflection will explain the activity and showcase the work produced. Many thanks to all our participants for their hard work and commitment, and to the instructors and volunteers who help make this program possible. A huge note of thanks to our many community partners for their financial support! Please click here to learn more about our sponsors. Contact Christina Katsolis at (386) 506-4569 or by email at Christina.Katsolis@DaytonaState.edu to register. Please feel free to reach out if you have any questions or would like additional details about each month's specific activity. NEW DATES/ACTIVITIES TO BE POSTED SOON! Collecting art has always given me great pleasure. My home is a gallery with a wide range of genres ~ pieces that calm me and inspire me ~ they have become part of my soul. And now, I create art that I want to share with the world. We all need to surround ourselves with beauty and inspiration reflected in the shapes, patterns and colors of our planet. Choose art in all of its forms... You will be enriched. Thank you to Babz Lupoli, Candy Barr and all our wonderful participants! Image gallery and journal reflection coming soon. 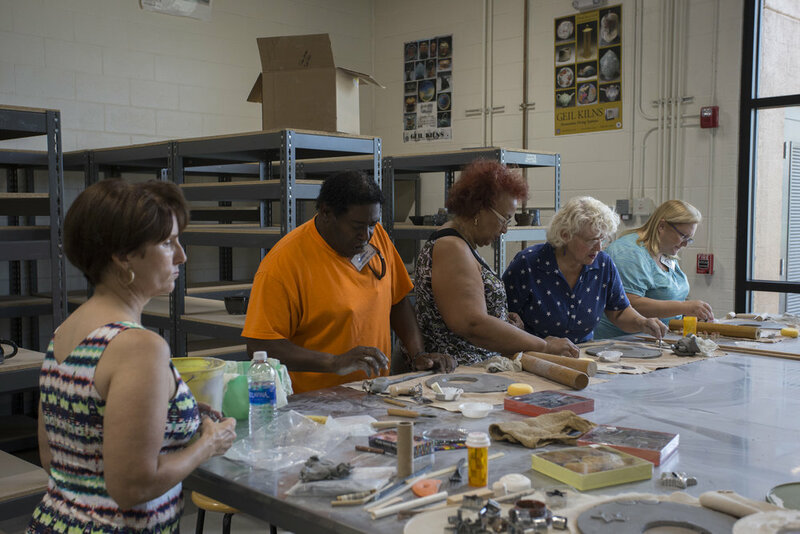 Class meets at Daytona State College, on the Daytona Beach campus in Building 520 (Studio Arts) in Classroom 102. Note: Please plan to bring a photograph or an image of a landscape (can be your own image or sourced from a magazine or book) that inspires you. All other materials supplied. Kristin Heron has long been influenced by Florida’s unique landscape, the flora and fauna of the natural world, and the curiosity of childhood. 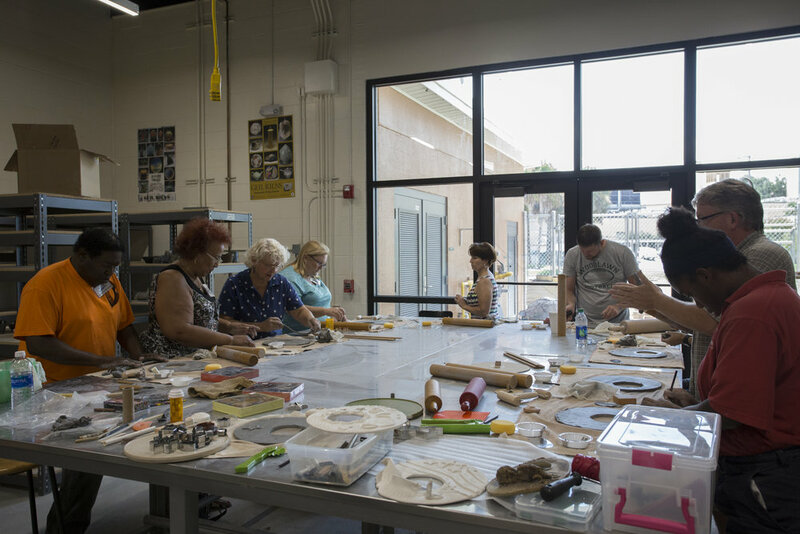 After earning a Bachelor of Arts degree in Studio Art and Music from Rollins College, she returned to her hometown with a deep commitment to engaging the community in the arts. 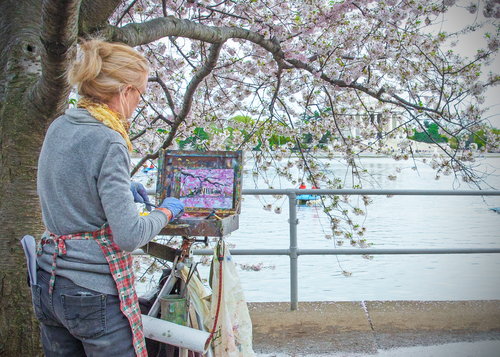 Kristin specializes in whimsical fine art, illustration, and creative graphic design services. 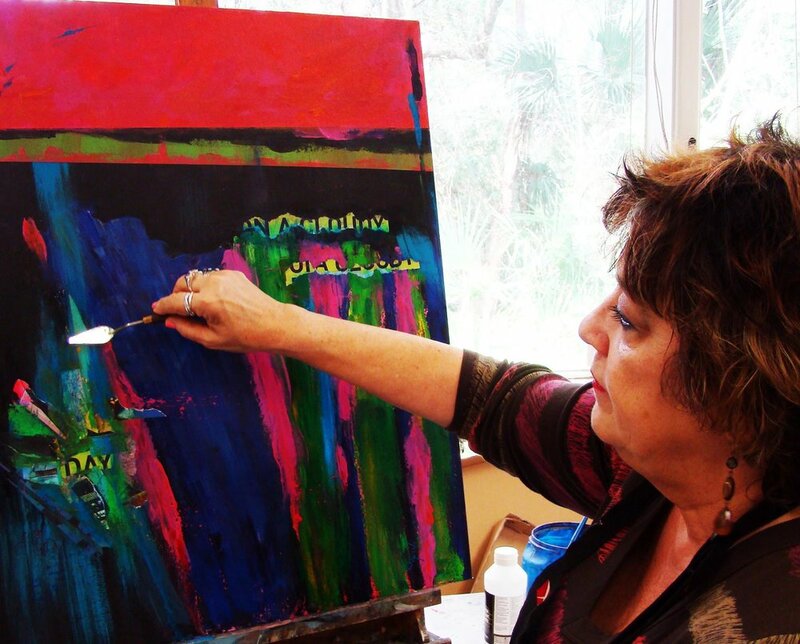 She can now be found creating in her Ormond Beach art studio, curating education and outreach programs for the Ormond Memorial Art Museum, and exploring the world for inspiration. 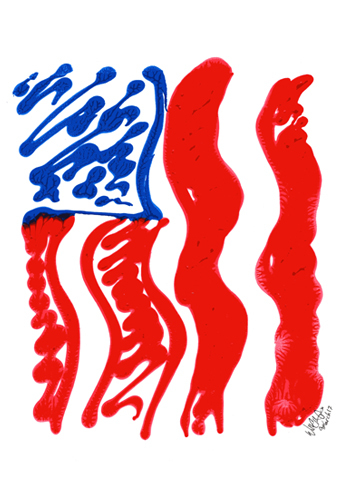 Her artwork is for sale online in her etsy shop and at specialty boutiques and galleries. 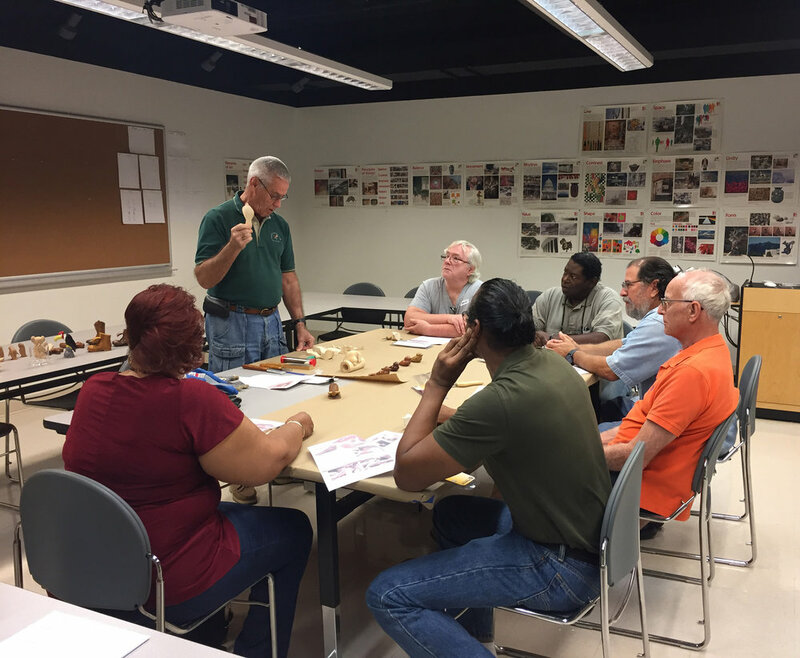 WOODCARVING - Please join instructor Bill Myers and try your hand at carving! 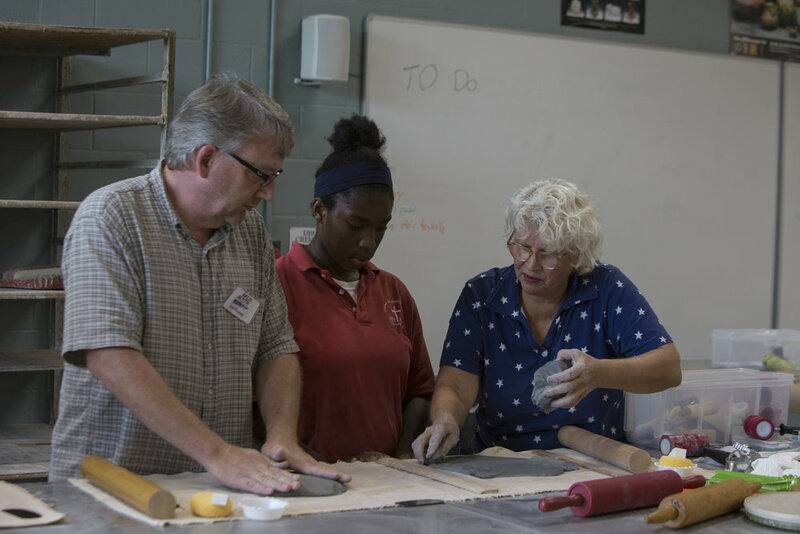 Many thanks to Bill Myers and Flexcut Carving Tools for making this activity possible! POLAROIDS: Please remember to send me a few digital files or have images on your phone! I have all the rest of the supplies necessary to convert your digital photos into custom, original Polaroids. MONOPRINTS: Trace an image from a magazine, bring along your sketchbook or just try your hand at drawing a unique design and turning it into a painting. The process is very easy and fun for beginners and advanced artists. 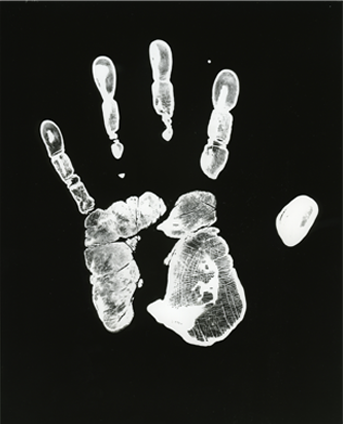 HANDPRINT & PHOTOGRAMS: These are achieved in a traditional black and white darkroom. 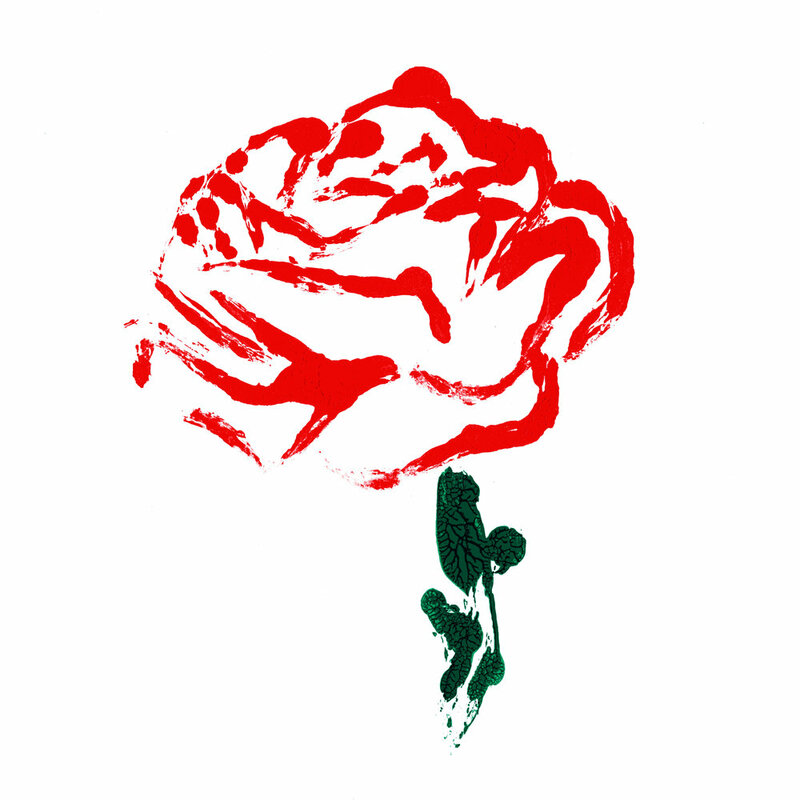 Feel free to bring objects, items from nature, or images that you feel would create a unique silhouette or pattern on the surface of the paper. OBJECTS OF SIGNIFICANCE: Please bring a few objects to which you have a great emotional attachment. These objects will be photographed and printed as digital prints for the exhibition. Note: I'm amazed at how many little "things" carry great significance, though we may not always give it much thought. Please think about what you have, and choose an item (or as many as you want) that you could explain or write something about. You can choose to hold the item for the photograph, or simply place it in the scene for the shot. CYANOTYPES: This is an extremely easy process-you can make a cyanotype from natural objects or photographs. Note: If you have older photographs and need them scanned, please bring them along and we will do that for you. If you have any questions, please email Christina.Katsolis@DaytonaState.edu or call (386) 506-4569 for more info. Thank you to all our wonderful participants and volunteers! I had a wonderful time introducing clay to our veterans who have served this country. It all started with small lumps of clay. Each person was invited to take a seat and asked to examine the portion of clay in front of them. At first glance, the task didn't seem too appealing. Shapeless, dull gray blocks (the exact color of old kneaded gum erasers) were spread out across the table. What could they possibly be expected to do with these? Artist Robbin Wren issued the day's deceptively easy challenge: make a sea creature. Well, not just make one. Create one from nothing. Give it a name and a personality. 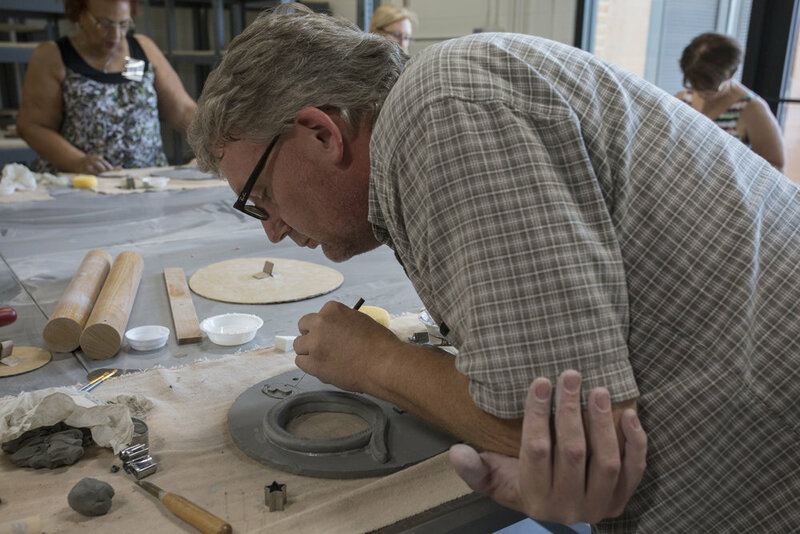 They followed a few basic steps, learning to get the feel of the clay, combining hollow ends and merging halves to form the basic shape of their creatures. After that, the details were entirely up to them. As chunks of clay began to transform into small animals–fish, manatees, whales, sharks and other whimsical creatures–laughter and encouraging remarks could be heard around the table. By the end of the session, our group had shaped and sculpted their way to some remarkable pieces with character, revealing their creativity and vivid sense of humor. Our second activity involved mask making, giving our group the opportunity to channel their feelings through the clay or simply let whatever begins to take shape guide their imagination. 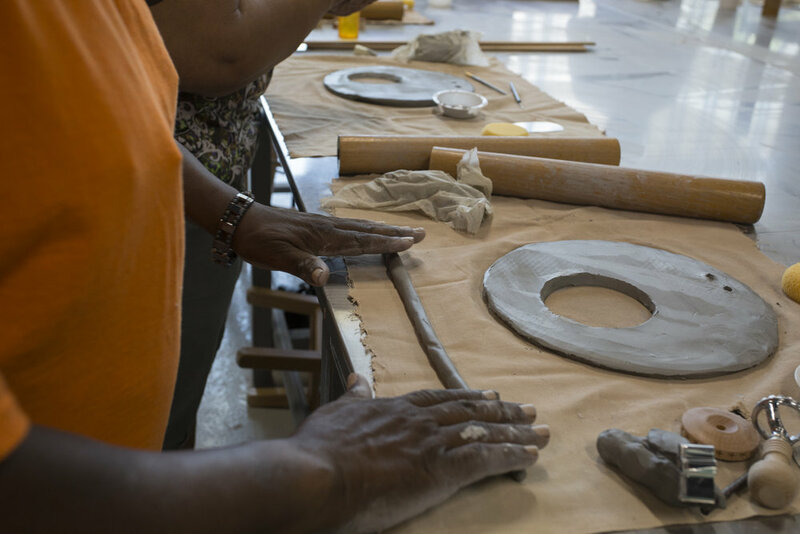 Working with clay takes concentration and careful handling, as every touch leaves an impression. A fingerprint can easily leave a crater in an otherwise smooth surface; a thumbnail causes unintentional crescent moons to appear. Brushes, ribs and needles were used alternatively to smooth or create texture, as layers were crafted and accents were painstakingly added, each one attached by a method of scoring and slipping. Again, the clay took on numerous forms, being rolled, cut, pressed and eventually molded into the form of the final mask. Each person had to decide what direction to take: were they striving for realistic facial expressions, following a masquerade theme, giving their mask animalistic qualities, or symbolizing a particular thought or concept? In the end, no two masks were alike. Each "face" reflected something different, encapsulating their ideas in a way wholly unique to their own artistic sensibilities. Thanks to everyone for rising to the challenge and sharing your vision! 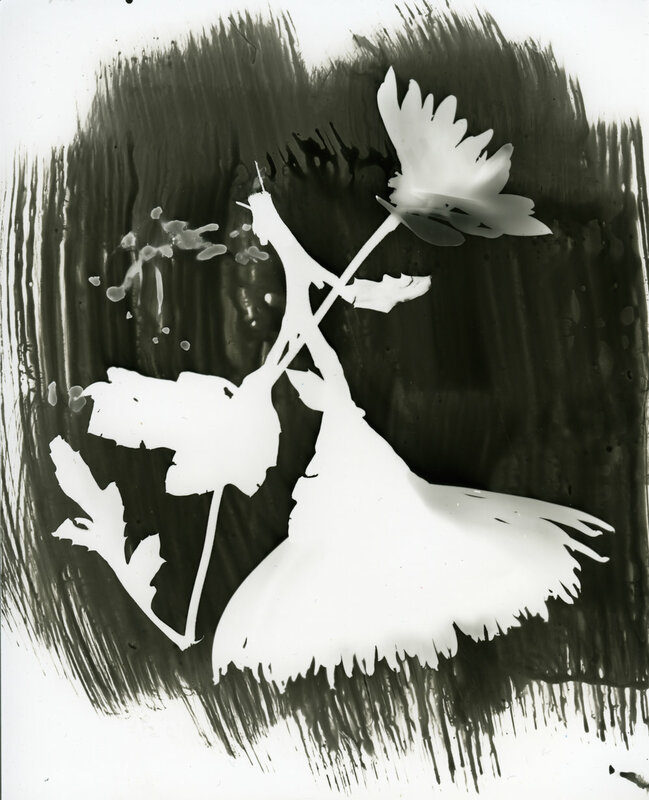 Photograms are the direct traces of objects on a photosensitive surface (usually paper) made without lenses or special optics. The area surrounding the object darkens from its exposure to light, while the area covered by the object remains white–or reveals subtler shades of gray–depending upon the object's opaqueness or the number of overlapping materials. By utilizing carefully chosen objects and incorporating elements of movement, an artist can selectively interrupt the passage of light to create both interesting and self-expressive works of art. By placing objects (some found, borrowed or bought from home) on light-sensitive paper, our group crafted beautiful compositions of interlocking shadows and shapes–some even using their hands to form an image or leave a lasting imprint. 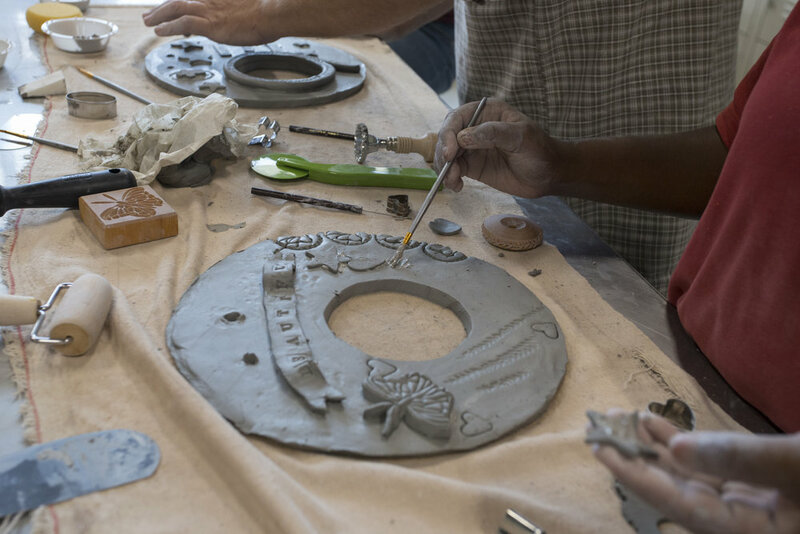 A few incorporated military symbols–ID tags, medals, pins, flags, silhouettes of replicas and other reminders of their service–to create pieces with profound meaning. Others used items like light bulbs, coins, intricate gears, small numbers and models, jewelry, feathers and flowers to convey their thoughts. John Graham is an expressionist painter whose work often depicts a psychological response to both an inner and outer landscape. In 2009, he was chosen by the Gargiulo Art Foundation as the Artist of the Year for furthering art in his community, where he continues to work as an artist, curator and teacher. He is co-founder of The Southeastern Coalition of Contemporary Artists and The Salvo Art Project. His work is in numerous private and corporate collections throughout the United States, Canada, Germany, Spain and Poland. Robbin Wren is originally from Los Angeles, California. She specializes in decorative and functional pottery, which she accentuates with lovely, carved designs. 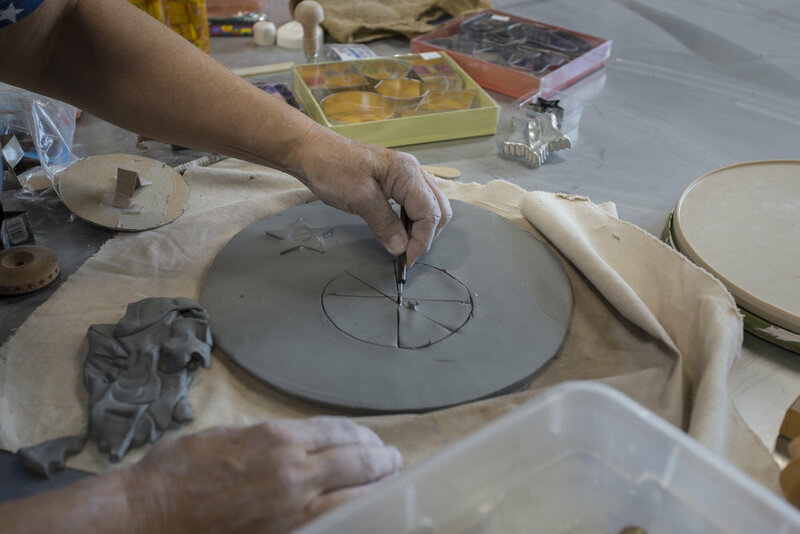 She has been working with clay for over 20 years, and taught wheel and slab work in Stone Mountain, GA at the Art Station before moving to Palm Coast, FL. 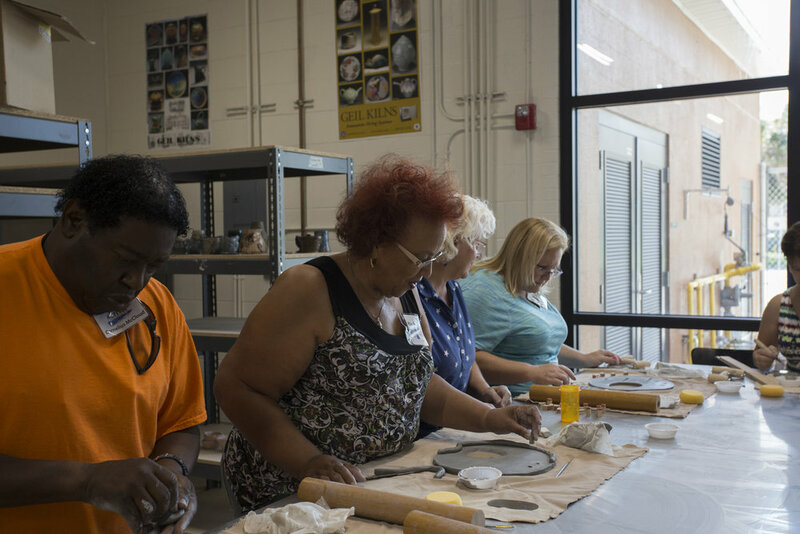 She was an instructor at FTI, teaching young adults with disabilities how to market their art and to support themselves using their talents and abilities. She currently sells her work through craft fairs and artisan markets, and offers private lessons to young or upcoming artists. Fang Ling Lee is a contemporary artist, progressive painter and sculptor. Raised in an eccentric artist family from Brookyln, NY, Fang Ling Lee has exhibited in Los Angeles, Las Vegas, Miami and New York City. Her work, which often depicts female figures laden with symbolic importance, is a stylistic blend of realism and abstraction, and has gained her an eclectic and international following. Recently, she has expanded her skill set towards film and television as a Production Designer, with her most recent credit as Design Producer for the third season of the Fox Television series, "Hotel Hell" with Gordon Ramsey. Patrick Van Dusen graduated from Florida A&M University, majoring in photography, and he taught for 37 years at Daytona State College, retiring in April 2011. His photography experience includes photojournalism, portraits and weddings. 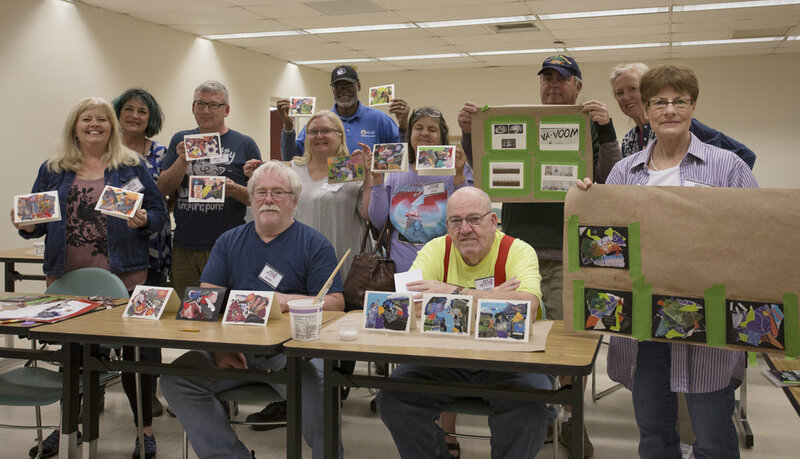 He is the volunteer with the longest time of service for Stewart-Marchman-Act Behavioral Healthcare, a Daytona Beach rehabilitation facility, where he conducts therapeutic photography sessions. Bill is the President of the Friends Carving Club of Port Orange and is graciously donating many of his own supplies to our Art in Action program. He served in the Navy, and was a Senior Engineer for General Motors. He now operates his own woodcarving business. He also shares his love and knowledge of fishing through Project Healing Waters, which is dedicated to the rehabilitation of disabled military service personnel through fly fishing, fly tying and associated activities. Nancy established her line of decorative earthenware, Nancy Newlove Pottery, since retiring and moving here a few years from New York. 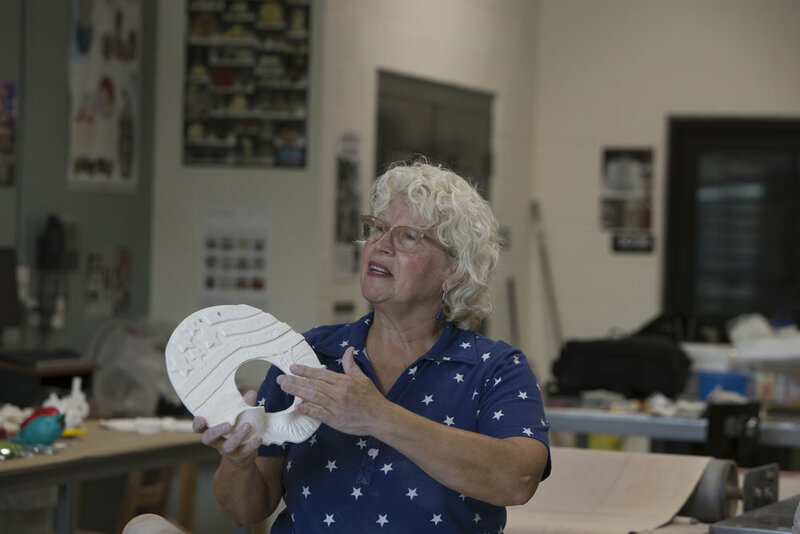 She holds a degree from Alfred University: College of Ceramic Art and Design and has worked professionally in Vermont and taught pottery throughout the years. Several of her pieces have been on display in galleries in New York, and are now winning awards here in Palm Coast. 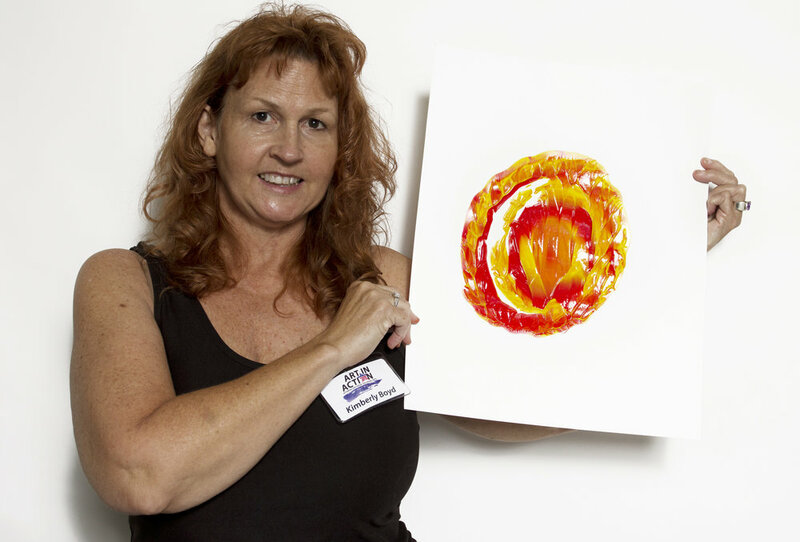 Nancy is an active member of the Flagler County Art League and the Florida Women's Art Association.